Joseph Kucera, Architect, 1932. The Fletcher and Winifred Starr Dobyns Estate. 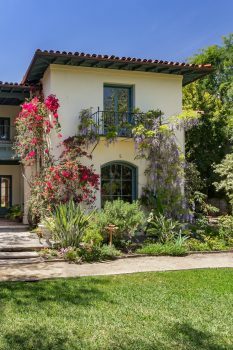 Chula Vista Avenue is a secluded, almost hidden short cul-de-sac tucked away in the Linda Vista neighborhood of Pasadena. Characterized by gracious homes from the late 1930s set amidst large trees and mature landscapes, the 5,578-square-foot Dobyns Estate was the first and nearly the largest house on this short street. Its high design blends formal Italian Renaissance Revival massing, gardens, and details such as the handsome column capitals and pilasters, with a more easy-going Spanish feeling, especially the relaxed asymmetry of the layout and in the inviting, porous relationship to the outdoors, seen in the large recessed rear terrace and the many pairs of French doors leading to the carefully laid out gardens or, upstairs, balconies. It was designed by a society architect and specialist in period revival styles, the Czech-American Joseph J. Kucera. The entry is a series of carefully orchestrated transitions, beginning with the approach, low myrtle hedges flanking the walkway through a shallow lawn and to a walled courtyard with a central fountain, paved with beautiful rectilinear paving stones present in so many upscale private and public buildings constructed in the 1930s. 870 Chula Vista Avenue is a residential property located in Pasadena, CA. This property sits on a 35414 sqft lot, is 5578 sqft, with 6 bedrooms, 5 baths.